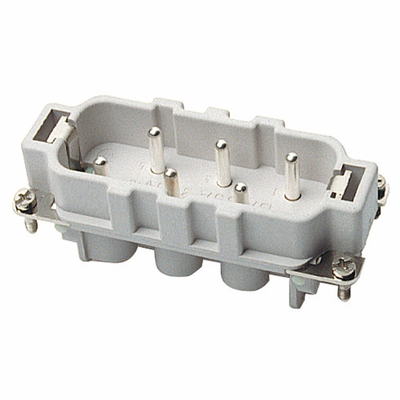 Detailed Description: Thomas & Betts Pos-E-Kon™ C Series contact carrier male pin insert features standard wire protection saddles for preventing cutting of strands during assembly and integral screw terminal contacts that provide for easy terminal wiring and fast assembly. It is made of glass filled thermoplastic material and has 6 + ground number of positions. It has voltage rating of 600 VAC and current rating of 35 Amps. Catalog Description Male screw terminal insert. For use with C series, 6 contacts with ground (1-6).